This unique tonearm alignment gauge allows you to check the tonearm geometry of your record player / turntable and to install the pickup ideally aligned (offset angle and overhang) to keep distortion to a minimum. Professional cartridge alignment protractor tool from Schon (improved Mk II version). 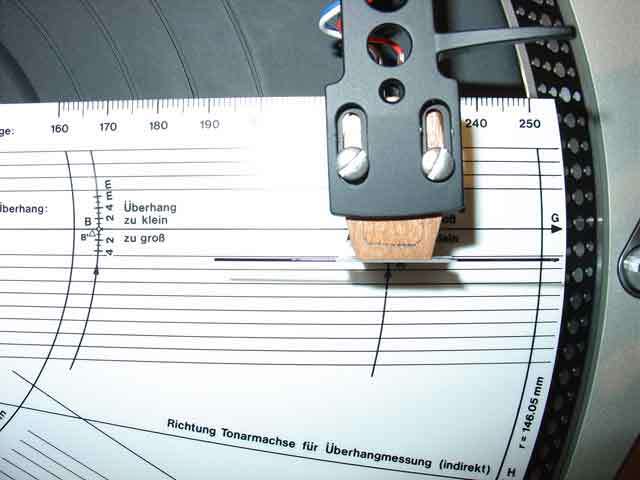 To get the best performance from your turntable alignment of the tonearm and cartridge is critical. 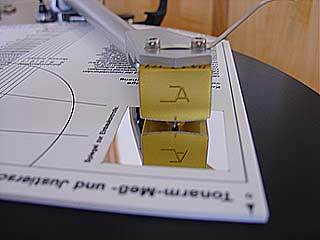 This protractor provides detailed instructions and allows you to make very fine measurements to get the best from your setup. Designed by Walter E. Schön and made in Germany. Suitable for all tonearm types. The importance of this for audio quality is shown by a comparison of the distortion (harmonic distortion HD2) caused by the relative lateral tracking error when playing a record with the distortion in the signal processing within the phono stage, pre-amplifier and power amplifier. If the tonearm geometry is not ideal, which is often the case, or if the installation of the pickup system was not checked, the harmonic distortion HD2 caused by too high a relative lateral tracking error can reach values of more than 3%. In contrast to this, all electrical components in a hi-fi system combined would show a value below 0.1% or sometimes, even under 0.01%. The importance of optimising the tonearm geometry with a high quality alignment gauge can therefore produce a much higher gain in audio quality than a much higher three to four figure investment in better components.